card text: Enchant creature Enchanted creature gets +3/+3. 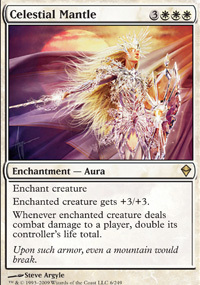 Whenever enchanted creature deals combat damage to a player, double its controller's life total. Great card if you can get the mana out quickly enough. Pairs ..